Daled Amos: Will Trump Speak to Jordan's King Abdullah About Extraditing Terrorist Ahlam Tamimi, Who Murdered Americans? Will Trump Speak to Jordan's King Abdullah About Extraditing Terrorist Ahlam Tamimi, Who Murdered Americans? This follows a Friday meeting, Secretary of State Pompeo met with Jordan's King Abdullah for lunch. The US and Jordan are supposed to be allies - in fact, Jordan is arguably our second strongest ally in the Middle East after Israel. No wonder talking about cooperation against terrorism is on the agenda. Since the establishment of diplomatic relations more than six decades ago, Jordan and the United States have enjoyed strong relations based on common goals and mutual respect. The relationship has endured the complexities and volatilities of the Middle East and has demonstrated that the two countries can rely on each other as allies and partners. 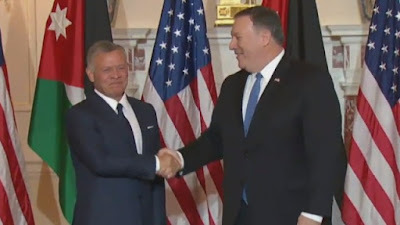 ...Following the September 11 terrorist attacks, Jordan stood with the U.S. in its effort to combat the common threat of terrorism and radical ideology. The two sides have worked together and with the international community to rid the world of the scourge of terrorism and end the threat posed to the national security of both countries. Why does Jordan refuse to extradite the Hamas terrorist that murdered 3 American citizens to the US? On Aug. 9, 2001, Ahlam Tamimi, a Palestinian woman transported suicide bomber Izz al-Din Shuheil al-Masri, a member of Hamas military wing Iz a Din al-Kassam, to the Sbarro restaurant. Fifteen people were killed, including 8 children and a pregnant women. Over 120 were injured. Three of those killed were US citizens. Tamimi was later captured and sentenced to 16 life terms in prison. She never expressed any remorse. On the contrary, in a video interview, she smiled and expressed satisfaction with the number of murders she accomplished. Tamimi: "I did. For nine days I examined the place very carefully and chose it after seeing the large number of patrons at the Sbarro restaurant. I didn't want to blow [myself] up, I didn't want to carry out a Martyrdom-seeking operation (i.e., a suicide attack). My mission was just to choose the place and to bring the Martyrdom-seeker (i.e., the suicide bomber). [I made] the general plan of the operation, but carrying it out was entrusted to the Martyrdom-seeker. ... I told him to enter the restaurant, eat a meal, and then after 15 minutes carry out the Martyrdom-seeking operation. During the quarter of an hour, I would return the same way that I had arrived. Then I bade him farewell. In October 2011, as part of the deal to free Hamas hostage Gilad Shalit, Ahlam Tamimi was one of those released. She returned to her native Jordan where she lived all her life, until about two years before she carried out the terrorist attack. Tamimi is now a celebrity throughout the Arab world, and was a host on a weekly show on the Hamas satellite TV station, Al Quds, where she extolled the virtues of "martyrdom attacks" against Jews and celebrated what she did. Only recently did she stop hosting the broadcasts, apparently in response to the extradition request, waiting for the situation to calm things down. 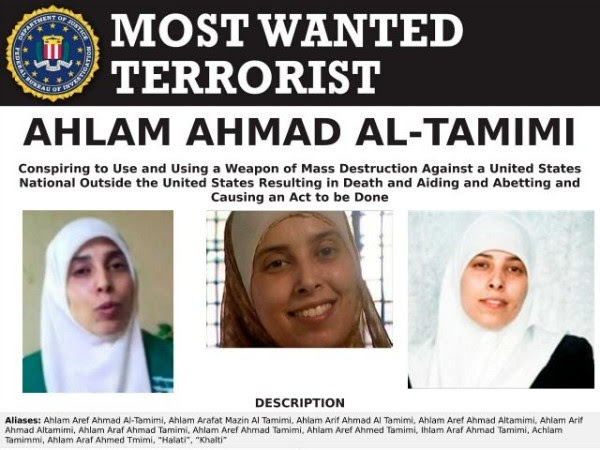 Last year, the US unsealed an indictment for the extradition of Ahlam Tamimi to the US to stand trial for the murder of the 3 American citizens murdered in the suicide bombing she masterminded. 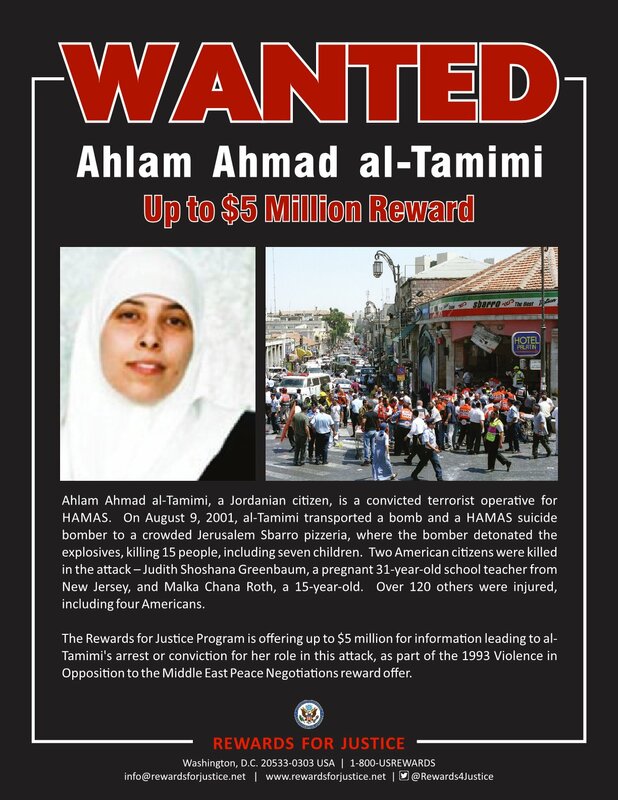 The State Department's Rewards For Justice program posted a $5 million reward for "information that brings to justice" Hamas terrorist Ahlam Tamimi. Jordan's extradition treaty with the US goes back to 1995. On February 26, 1993, a truck bomb containing 1,336 pounds of urea nitrate–hydrogen was detonated below the North Tower of the World Trade Center in New York City. The detonation was intended to murder tens of thousands of people. Though the plot failed, it did kill six people and injured over a thousand. Four men were convicted. Ramzi Yousef, who masterminded the bombing fled to Pakistan and Eyad Ismoil, who drove the truck carrying the bomb, escaped to Jordan. In order to extradite Ismoil from Jordan, the US and Jordan signed an extradition treaty. Based on that treaty, US agents were allowed to go onto Jordanian soil where the Jordanians handed Islmoil over, to be brought back to the US for trial. He was tried, convicted and sentenced to life. Al Jazeera has reported that "Jordanian courts have said their constitution does not allow for the extradition of Jordanian nationals." (i) Political refugees shall not be extradited on account of their political beliefs or for their defence of liberty. (ii) Extradition of ordinary criminals shall be regulated by international agreements and laws. Get it? If the Jordanian government is claiming that its constitution forbids extraditing Tamimi, it has to claim that the Sbarro massacre was a “political” crime. That’s outrageous." More to the point, the second point in Article 21 states that extradition is regulated by international agreements and laws. She said the U.S. has no right to charge her, arguing that she was already tried and sentenced in Israel. "How come I should be returned to jail again for the same charge," she said Tuesday. Nor could Jordan or any other requested country invoke the bar against double jeopardy that appears in many extradition treaties to prevent second punishment after a criminal prosecution for the extraditable offense has been conducted and fully carried out. That provision obviously does not prevent extradition of a fugitive who flees a country where he has been convicted in order to avoid imprisonment. It also should not prevent extradition if, by some other unlawful means such as Hamas’ extortionate demand, the criminal process is aborted. A criminal complaint was unsealed today charging Ahlam Aref Ahmad Al-Tamimi, also known as “Khalti” and “Halati,” a Jordanian national in her mid-30s, with conspiring to use a weapon of mass destruction against U.S. nationals outside the U.S., resulting in death. The Jordanian Court of Cassation ruled that the original extradition treaty was never ratified by the Jordanian parliament. This argument appears the strongest, if also the oddest. The treaty was the foundation of the extradition of Jordanian national Eyad Ismoil, with US agents arriving in Jordan to pick him up. How could that happen if there was no treaty? 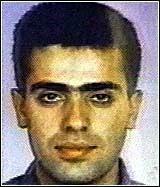 The handover of Eyad Mahmoud Ismoil Najim was a political hand grenade in Jordan. The first extraditions ever of a Jordanian national accused of a terrorist crime against the United States would also be the last. A week after the extra Eyad Mahmoud Ismoil Najim to the United States, the Jordanian Parliament scrapped the treaty. In addition, last year Michelle Munneke, an assistant district attorney, wrote Pressure on Jordan: Refusal to extradite mastermind of deadly 2001 Sbarro suicide bombing in Jerusalem contravenes international law and agreements, arguing that Jordan's refusal to honor the treaty contravenes the "principles of international comity," analyzing the legal justifications given for refusing to extradite Tamimi -- and disproving them. This analysis means the United States should not give up on attempting to extradite Al-Tamimi. If other countries place enough pressure on Jordan due to concerns of Al-Tamimi’s danger and susceptibility to planning another attack, Jordan may change its position. Al-Tamimi is above all else, a significant danger that Jordan should take seriously—if not for the world, for Jordan’s own citizens that live amongst Al-Tamimi. An additional issue is the International Convention for the Suppression of the Financing of Terrorism, to which Jordan is a signatory. Even if we take at face value Jordan's claim that there is no extradition treaty, that does not leave Jordan off the hook for harboring an admitted Hamas terrorist. The Government of the Hashemite Kingdom of Jordan does not consider acts of national armed struggle and fighting foreign occupation in the exercise of people’s right to self-determation as terrorist acts within the context of paragraph 1(b) of article 2 of the Convention. Looks like Stephen Flatow's suspicion of Jordan's cynical approach to fighting terrorism was correct. If so, it is time for Jordan to clearly state that it is defending Tamimi and preventing her facing justice is based on Jordan's considering Tamimi's terrorist attack on the Sbarro pizzeria to be a heroic act of national armed struggle. In any case, this makes the Jordanian claim that an extradition treaty that was used in the past is suddenly non-existent suspicious, to say the least. While King Abdullah II of Jordan likes to talk about trust and confidence, the king is going out of his way to avoid building it with his refusal to fulfill his obligations under the US-Jordanian extradition treaty and handing over Hamas terrorist Ahlam Tamimi to the US. His actions, or in this case - inaction, speaks louder than the convenient statements of friendship and alliance. When we add Jordan's reliance on the US for the financial assistance required to maintain his kingdom, this sense of obligation only increases. The US government has made clear that it is serious about prosecuting Ahlam Tamimi. It remains for King Abdullah to demonstrate that he really is serious when he claims to be an ally in fighting terrorism.